After Connie Crosby's Slaw post on Canadian legal publishers all stepping up to the plate with RSS feeds, I got inspired. For some time now, I've wanted to create a website that shows how useful RSS can be outside the personal reader. And with Canada being all the envy these days ;), I started to consider if Canadian legal publishing could work within a Dave Winer-River-esque type of concept? ... I was pretty sure it could, so last Friday I set out to re-mix those feeds into a dynamic, date sorted page of Canadian legal products. And so I offer LegalPubs.ca, a site that I hope will evolve into a functional resource for law librarians, and really, anyone tasked with developing a legal research collection. For those with personal feed readers, the combined Publisher feed is available with full text descriptions. On the website, I decided to shorten the descriptions to make it easier to read -- the page would go on-and-on otherwise. All feed item link directly into the publisher websites, where you will get the full product description, pricing, ordering, etc. There are still some kinks to work out, which I did note on the site's About page. I've tendered the site to the CALL listserv and asked my fellow Canadian librarians for some peer feedback. If anyone else has suggestions, I'd love to hear it. With the appointment of Tom Woods to the Provincial Court bench, the Vancouver Bar Association — publisher of the Advocate — is now seeking applications from those wishing to serve as editor. There is no need for any applicant to be resident in Vancouver. The position pays an honorarium. The deadline for application is Friday, January 18, 2008. In the meantime, the journal will be edited by Peter Roberts. Until further notice, all editorial correspondence should be addressed to Peter. "Justice Bastarache is telling us that the Supreme Court of Canada is planning to make factums available online next year, at least in some measure. He is explaining all of the issues that the Court is currently considering, as it struggles to develop a workable policy concerning the electronic publication of these documents. The Court has not yet decided whether and how to “clean” the files of sensitive business or personal information; they are still consulting, but a decision on these various matters is “imminent.” The Court, then, is convinced that the values of openness and access to justice must outweigh all other interests in principle, at least." BC Legislation service Quickscribe is on a roll these days. They've just launched their new website -- which looks great -- and are now offering one of the best RSS for legislation tools on the market. 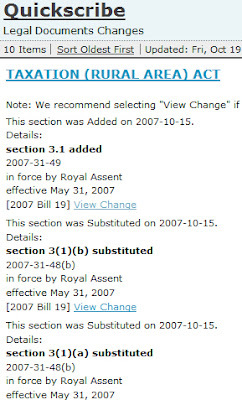 Even if you aren't a subscriber to their online service, the free version of this RSS tool is a welcome addition to watching legislative changes here in the BC. In particular, I see two features that really stand out: 1) the ability to personalize which Acts and Regs you want in the feed, and 2) the section-by-section changes that are detailed to the subscriber. Other than law librarians who may be tracking changes for multiple stakeholders, most users aren't going to need updates for every BC Act & Regulation. As I've said before, RSS technology is at its best when used as a filtering tool. The Quickscribe offering fits that vision by allowing users the choice of all BC legislation, topic categories, or the ability to hand pick your own custom list of Acts & Regs. And according to Quickscribe's Mike Pasta, in the future we can expect to see both keyword search feeds, and RSS tracking for current bills. For Quickscribe's paid subscribers, the icing on the cake is the ability to link into their online tool, and see each paragraph in full text, before and after the amendment. I tried to do a screen capture on this, but wasn't able to do it justice. You can check out this video tutorial for a better picture. Back when I posted my top-10 uses for RSS in law firms, I said that legislative feeds are going to be an important selling point for the future. BC firms are now in the position to re-publish these feeds on their Intranets (sorted by practice area, industry, etc. ), and lawyers can create custom solutions for their personal information needs. Now, if I can just get an RSS icon on the bottom of my CanLII search results, I'll be one happy law librarian. After a big gap in blogging activity over the past couple weeks, I'm faced with a couple alternatives... ignore all the blog worthy stuff that's happened recently, or consolidate & respond. Albeit in a limited way. First up, a big congratulations to Ron Friedmann on his new SVP role with legal vendor Integreon. A bit sad to see Ron's consulting practice close, but his fit with Integreon's expertise - outsourced legal & knowledge services - looks like a great match. I wish him the best of luck! I had noted Nick Holmes update on the growth of UK law blogs as another possible post, and then Nick went and included me in his top-10, to which I'm very honoured. And please ignore the mutual back-slapping here, but if you enjoy my entries, Nick and his blog Binary Law are right at the top of my list too. Michelle Golden made us re-think the basics when it comes to visual images -- Smiles Sell, and showing "some teeth" can do wonders. So advise your stoic peers, it may be time for a photo makeover! Connie Crosby posted over on Slaw that Canadian legal publishers are now all offering RSS feeds as a method of watching for new products. Very cool, and a big thanks to each of them. Rob Golbeck at my old Canadian law firm is settling into his new role as the firm's Webmaster. And since the firm has continued its relationship with me, as Stem's first client, Rob and I still get to work together. To which we're both thankful. And finally, I'm starting a new article series on Slaw called Web Law Connected, with the first article addressing the concept of Thought Leadership, and the building of online expertise within the legal profession. Yes a hodge-podge, I know... But if only for my own reference purposes, well worth capturing.